The Fully Automatic Lifeline AED is designed to analyze heart rhythms and take action, automatically delivering a shock, without the need for intervention. 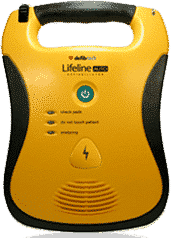 The Lifeline AUTO AED includes an array of features mission critical to providing the most cutting edge treatment for Sudden Cardiac Arrest. The Lifeline AED’s simple 1 button user interface, clear, calm voice prompts, highly visible progress lights and actively illuminated status indicator, all contribute to making The Lifeline one of the most user friendly defibrillators available. The Lifeline AED has a roomy handle and rubberized surfaces for durability.